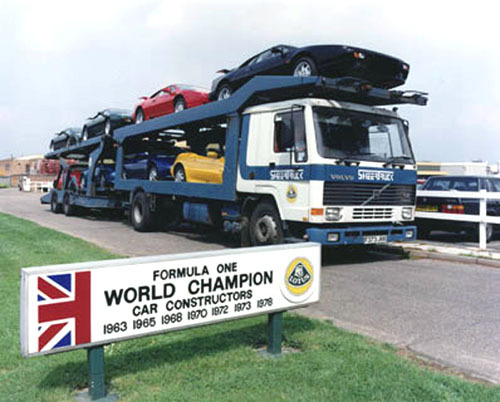 The major leap forward came in mid-1989, when Lotus finally made a charge-cooled engine available. To be frank, it was long overdue, for although the company had been one of the very first to put a turbocharged road car on sale, they had then fallen well behind other manufacturers as they refined the technology further. The theory of charge-cooling, or intercooling, is simple enough. Compressed air forced out of a turbo compressor is hot, and if it can be cooled before entering the engine the volumetric efficiency is dramatically improved. Cooling is done through a radiator — either an air-air type, or an air-water type. As might be expected, the Lotus installation was neat and effective. In this case the charge cooler was mounted on top of the engine, and the coolant was water, this being in a self-contained system, circulated by an engine-driven pump to a front-mounted radiator. This, however, was merely part of a comprehensive improve-ment package, which also included Lotus/Delco injection and the ability to run on lead-free fuel, a catalyst being standardized. Not only did all this help push up peak power to 264bhp (DIN) at 6,500rpm, but there was also a transient over-boost facility which allowed usage of 280bhp at 6,500rpm for up to 30 seconds of hard acceleration. Two years after this charge-cooled engine had been launched, a further variant was introduced, this being a 2-litre version, initially for sale only in the Italian market. The rationale was fiscal, not technical, for in Italy much higher motoring taxes were applied to cars with engines of more than 2,000cc. There were precedents for this move — Ferrari, Maserati and Lamborghini had all offered smaller-engined versions of their cars from time to time, though in no case had sales come up to expectations. The development cost of producing a smaller-capacity engine — which actually used the self-same crankshaft as the original Type 907 engine had done in the Seventies — was small. 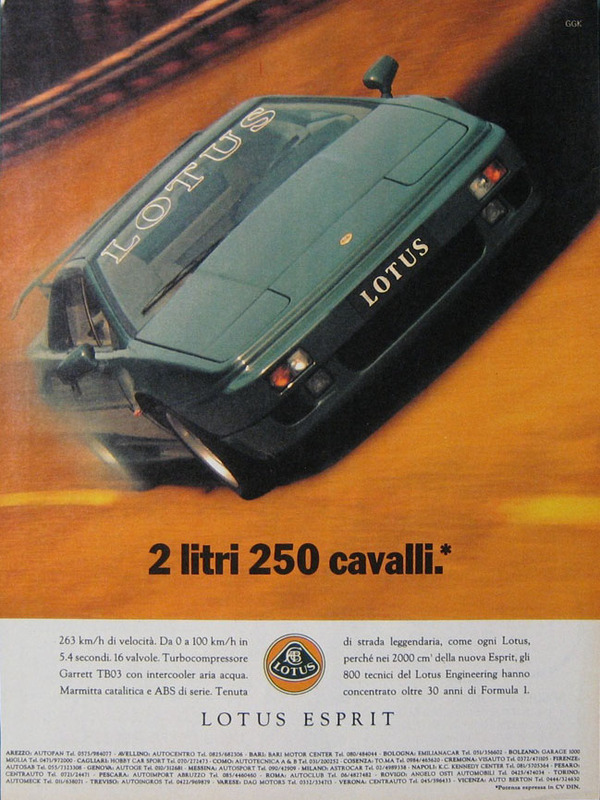 With the introduction of the charge-cooled turbo engine, Lotus claimed the title of the world’s highest specific output for a road-car engine (121bhp/litre), though this was not likely to be held for long. By the early Nineties the famous 16-valve engine had been on the market for 20 years, but Lotus clearly thought more potential was still locked in there. In 1992, as this book was being prepared, the first of an entirely new design of aluminium cylinder block, more rigid than ever before, was phased into production. 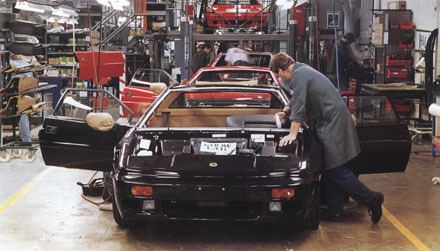 In the spring of 1989, when the charge-cooled engine was put on sale, Lotus also introduced a series of chassis and engine changes to the Esprit. The ‘Eagle’ chassis, so called because of the exclusive use of Goodyear Eagle tyres, which is easily identified by its use of 1 Sin diameter front and 1 6in rear wheels, was standardized on all Esprits at this time, but the derivative with the 264bhp charge-cooled engine became the Turbo SE (SE = Special Equipment). The cost was a massive £42,500. The SE not only had far more performance — a top speed of 159mph and 0—60mph in 4.9sec, which was remarkable by any standard and equal to the performance of the Porsche 911 Turbo of the period, but there had been further changes to the aerodynamics. At the front there was a deeper front ‘bib’ spoiler, the sills and their associated air intakes to the engine bay had been reprofiled and, for the first time on an Esprit, there was a small free-standing spoiler on the tail. Air conditioning and a tilt/removable glass sunroof were also standard. The next batch of important changes came in the autumn of 1990, effectively for the start-up of the 1991 model year. 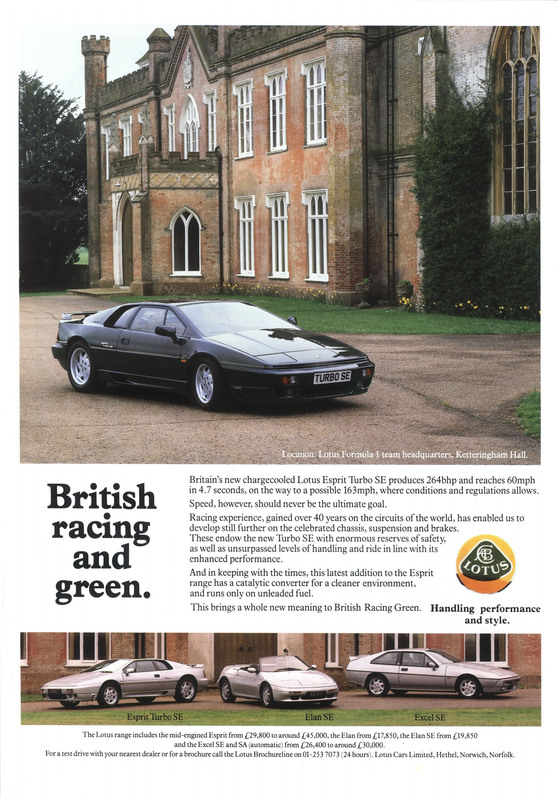 This was the point at which the normally-aspirated Esprit finally died, and when a whole series of model name changes confused the historians, particularly if home market and export market titles were compared. 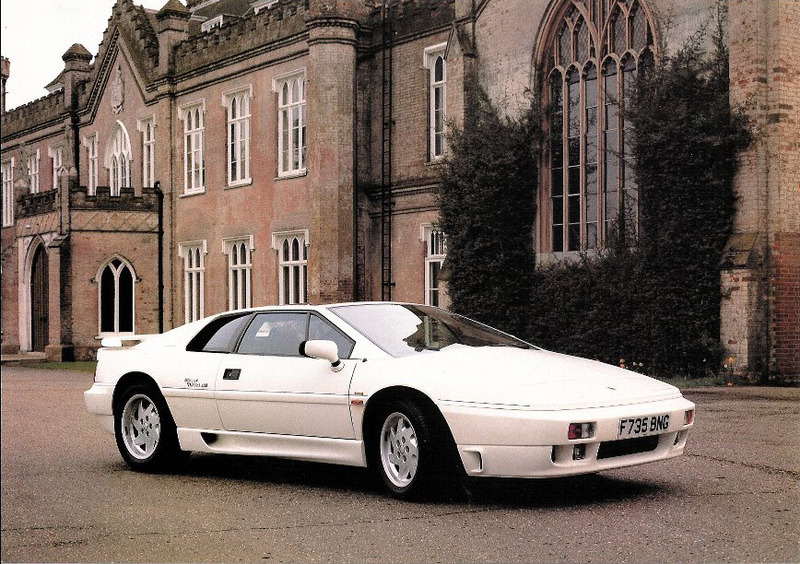 The Esprit received substantially changed bodywork in 1988, offering a more rounded profile as well as improved aerodynamic drag. Several variations of rear wing for both the SE and Turbo were to be seen over the next few years. The Esprit SE in 1992 guise (right) with its dramatically high-mounted wing supported by short struts over the tail of the body and long arms extending from the back of the cabin. 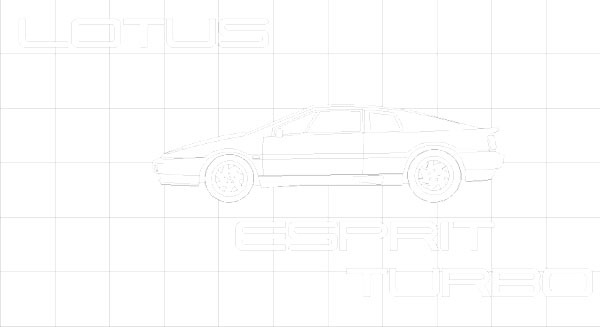 By this time, however, the Lotus factory and the Lotus dealers could no longer give the Esprit their full attention. They were too bound up in the front-wheel-drive Elan, which had been on volume sale since April 1990, to think of much else. 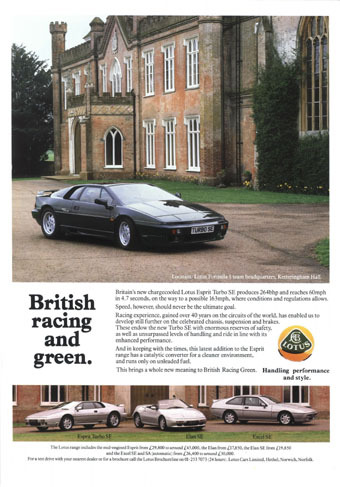 This was also the point at which British economic recession began to bite in earnest, and when Lotus should have realized that the Esprit was beginning to look expensive. 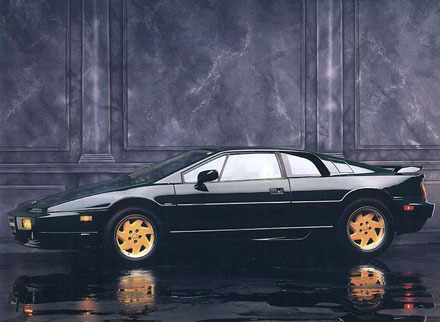 Perhaps this also explains why the Esprit S had such a short life — for it was dropped after only a year. Twelve months later, and at a point when the front-wheel-drive Elan still appeared to be selling very well indeed, more Esprit changes were phased in. Not only was there a very significant improvement to the cabin packaging of all types, but the SE model received an extrovert new styling package which was claimed to reduce understeer and raise the top speed. 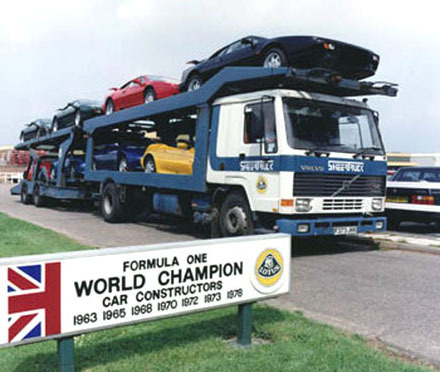 From this point, all Lotus cars were provided with a three-year unlimited-mileage warranty — experienced, not to say cynical, Lotus owners thought this was likely to be a very expensive deal for Lotus! — and no doubt partly to allow for this the UK prices were raised yet again, with the price of the flagship SE ni.odel soaring to £48,260. Somehow or other the cabin had been repackaged and made more spacious. Compared with earlier cars there was an extra 5.6in of headroom, 1 .6in more legroom and up to 3.2in more clearance between the seat cushion and the steering wheel rim. A repositioned cabin/engine bulkhead made the cabin 1 .2in longer overall. There was a revised pedal box which gave shorter pedal movements and the centre tunnel had been slimmed down to allow wider seats to be fitted. Added to this was the provision of doors which opened by an extra 1 Sdeg — and if this does not sound much, it equated to an extra 9in at the rear end of the doors. The principal visual changes were only applied to the SE type, the official reasons being twofold: to add front-end downforce to cut the understeer, and to improve rearward visibility. The glass-back which had featured on X180 types since 1987 was abandoned, the original small spoiler of the SE was no longer fitted, and in their place was a larger and free-standing rear aerofoil, mounted on pylons. To balance this, at the front there was an extra rubber lip under the existing ‘bib’ spoiler. Lotus claimed that the overall effect was to improve downforce at higher speeds, to cut the drag and to raise the top speed to no less than 165mph. Even so, by mid-1992, when the Elan was suddenly killed off and the last Excels had also been built, the Esprit had faded quietly into a limited-production backwater all of its own. Yet again sales in the USA had collapsed, and the British recession had hit hard at sales of all high-performance cars, resulting in Esprit production being cut back to no more than five cars a week. 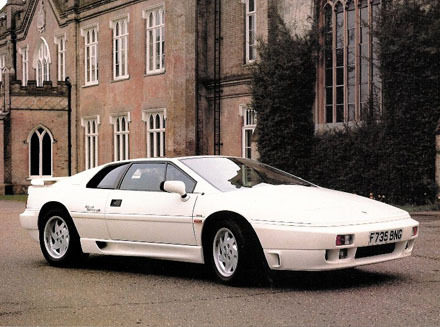 By 1992 the Esprit Turbo SE had been further modified, with a more spacious interior. It had also been given a large and aerodynamically efficient rear aerofoil to improve its stability. But it was a short-lived model, for early in 1993 this S4 version was unveiled, with an even smoother profile and important chassis changes which were to transform the Esprit's handling at a cost of a somewhat firmer ride.